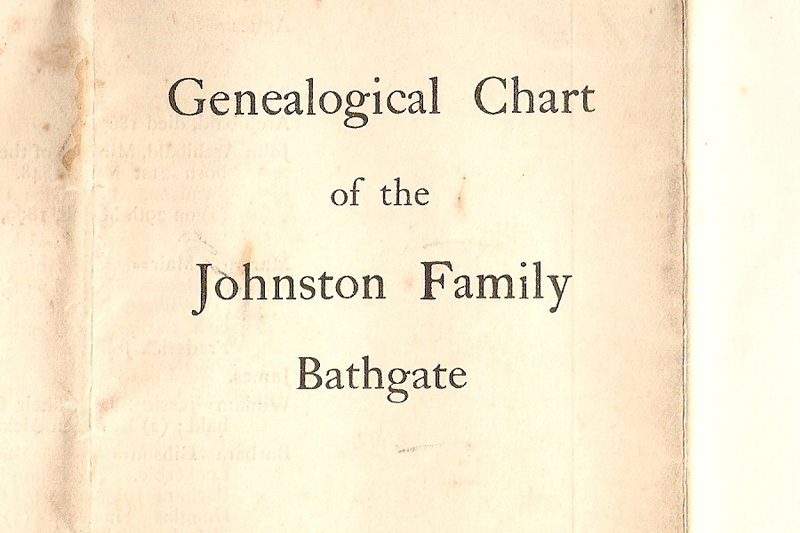 Among WALKER family papers there is a fabulous, printed family tree titled “GENEALOGICAL CHART OF THE JOHNSTON FAMILY, BATHGATE”. This tree begins with James JOHNSTON, “at and previous to the year 1692. Farmer (at) East Mains of Ballencrieff, Dykeside, and Nethermuir, Bathgate (West Lothian)”, and his wife; Elizabeth SMITH. Ballencrieff, Dykeside, and Nethermuir are farms that lay just north of the town of Bathgate. 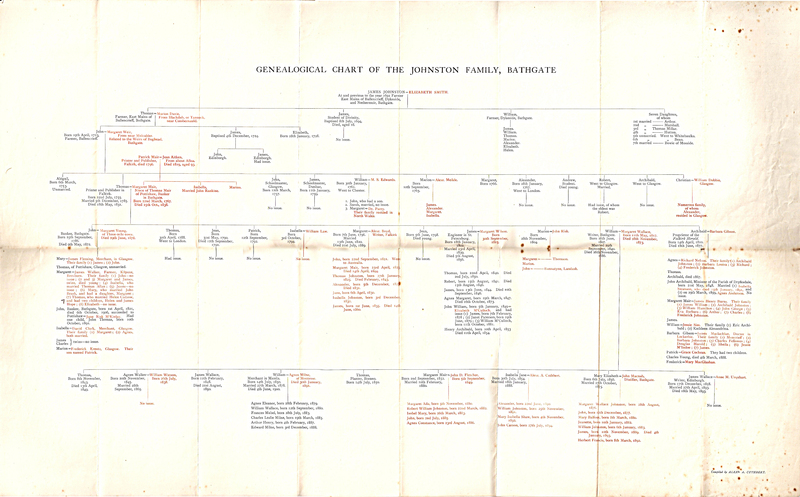 The tree covers 7 generations of the JOHNSTON family and their descendents. It appears to have been compiled by an Alexander CUTHBERT, who had married into the JOHNSTON family in 1888. Although no date is given for when this tree was compiled, the last date it contains is the death of a John JOHNSTON (a banker in Bathgate) in October 1906. While the earlier generations were farmers, the tree shows that (partly through marriage) some in subsequent generations became involved in printing and publishing in Falkirk (owners of the Falkirk Herald newspaper and the origins of the Johnston Press), and in banking in Bathgate. I have scanned this tree (see image below). The tree is on a large sheet – 26 ¼ x 16 ½ inch (66.8 x 41.8cm), so this image is a combination of 6 x A4 scans stitched together in Photoshop. Please click on the image to view the scan at full resolution. A full “Genealogy report“, containing additional details about people. 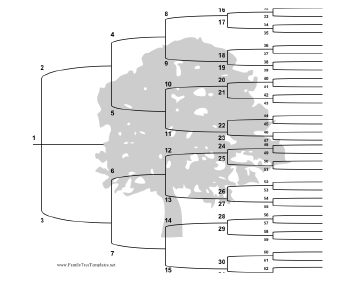 Most of the information in these files comes directly from this original printed tree. Some of this is collaborated by other family documents. I have also done my best to check it against records that are accessible on microfiche, or in a transcribed form online (e.g. parish registers, censuses, etc. ), and to add any extra details that I find from those sources. This tree forms part of my WALKER ancestry which you can find out more about HERE. If you share a connection with this tree, please do leave a comment below, or get in touch via the Contact page. In no particular order I’m making several posts to show my known ancestors, in a “pedigree view”, starting each pedigree with one of my great-grandparents (for people’s personal privacy I will not give details of the more recent generations). The Roman Numeral in front of a name indicates the generation (counting backwards) and the number of “great”s that you need to add to describe their relationship to me. i.e. Click the numeral to link to any posts tagged with that individual’s name, or to all the posts tagged with that surname (if the individual person doesn’t have a tag). If someone’s name is highlighted as a hyperlink, you can click that link to an external webpage with information about that person. I generally favour entries on Wikipedia, though other sources may come up if there is nothing on Wikipedia, or if the alternative offers better information. -v-[ William WALKER, b. cir 1694, d. 01/01/1768, Kirkliston, m. 14/06/1728, Kirkliston/Corstorphine. -v-[ Elizabeth BARRON (or BARON), b. ?? ?, d. ??? -iii-[ John WALKER, b. 13/01/1772, Kirkliston, d. ? ?/08/1840, m. ? ?/05/1816, ?. -iv-[ Janet FLINT, b. 1739, d. 12/12/1817, Kirkliston. -ii-[ James WALKER, b. 24/01/1818, Kirkliston, W.Lothian, d. 06/05/1881, Broxburn, W.Lothian, m. 23/02/1847, Bathgate, W.Lothian. -iv-[ George NEIL, b. ?? ?, d. ?? ?, m. ??? -iv-[ Barbara DOUNS, b. ?? ?, d. ??? -i-[ Thomas George WALKER, b. 04/03/1858, Kilpunt, Broxburn, W.Lothian, d. 19/10/1951, Radwell, Hertfordshire, m. 19/06/1894, Bangour, to Helen Black (“Nellie”) CADZOW. -v-[ John JOHNSTON, b. 19/04/1723, d. ?? ?, m. ??? -v-[ Margaret WEIR, b. ?? ?, d. ??? -iii-[ John JOHNSTON, b. 25/09/1786, d. 09/05/1872, ?, m. ??? -v-[ Patrick MAIR, b. ?? ?, d. 1796, m. ??? -ii-[ Margaret JOHNSTON, b. circa 1818, d. 15/09/1890, ? -iv-[ Thomas YOUNG, b. abt 1747, Ecclesmachan, W.Lothian, d. 17/03/1824, m. 29/12/1772, Muiravonside, Stirling. -iii-[ Margaret YOUNG, b. abt 1794, d. 29/06/1878, ? -v-[ Alexander SMITH, b. ?? ?, d. ??? -v-[ Mary FISHER, b. ?? ?, d. ??? WALKER family tombstones in Kirkliston parish churchyard. I have seen these myself. But there are also now several websites where you can obtain transcriptions and photos of these tombstones. Take care with the transcriptions on these websites though! I have a difference of oppinion with at least one of them about the reading of an age of death on a very weathered tombstone! 1851 Census – My own search of the 1851 census, in Kirkliston parish. Viewed on microfilm at Edinburgh Central Library. Letters from Janet WALKER – to me, in 2008, including transcriptions of some very old family papers. I hope to see the original papers for myself very shortly! These old papers are almost certainly a source of some of the information in T.G.A.WALKER’s “A history of the WALKER family”. “Sampler” by Mary YOUNG – Elder sister of Margaret YOUNG (m. JOHNSTON). Sampler dated 1789. This sampler, and a later one by Margaret JOHNSTON (b. abt 1794) are framed and in the possession of the WALKER family. Initials contained on these samplers, of siblings, parents, grandparents, etc, helped me to identify records of those generations in the IGI.